A danger to orchids any time the weather is rainy or damp for extended periods, black rot can quickly destroy an entire plant if left unchecked. Caused by one or both of the fungi Pythium ultimum and Phytophthora cactorum, black rot affects a wide variety of orchids. Cattleyas seem to be particularly susceptible. 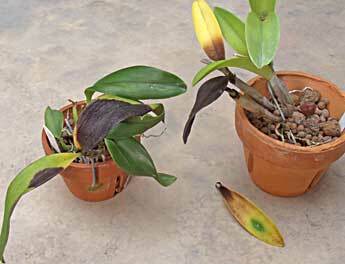 The fungi that cause black rot in orchids can live only in environments where water is available to them. They consist of spores capable of independent movement, called zoospores, which swim through the water. If that water happens to be sitting on an orchid leaf, the zoospores can penetrate the plant tissue and begin the next stage in their life cycle. At this point, the fungus develops a vegetative part or mycelium consisting of hyphae (thin, thread-like tubes), which spread quickly through the affected plant tissues. Once this occurs, the visible signs of infection - small, watery, translucent spots - expand quickly and change to brown and then black. Left untreated, the affected plant or plants may infect others and will probably die themselves. When the fungus attacks seedlings, it is usually at the soil line. This can cause the little plants to topple and die, and is referred to as damping off. In mature plants, the disease can strike at any point on the plant (leaves, pseudobulbs or roots), but often starts in new leaves or growing leads, and progresses downward through the plant until reaching the roots..
As it name implies, black rot shows up as dark blackish spots or lesions on the affected plant part. 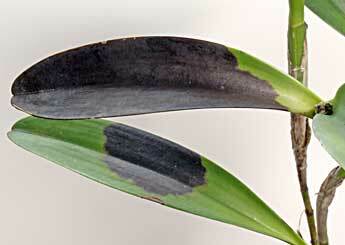 The black spot or spots enlarge rapidly and can spread throughout the plant. If allowed to reach the crown of a monopodial (single-stemmed) orchid, the rot will kill the plant. Affected leaves may turn yellow around the infected area, and the lesions themselves will be soft and exude water when pressure is applied. Unsterilized pots, media or water sources, as well as water splashed from affected plants nearby, are all excellent means of spreading the fungus. In addition, plants that spend time outdoors should be elevated 3 to 4 feet (90 to 120 cm) above the ground to avoid splash contamination. Do not allow your orchids' leaves to remain wet for any extended periods. Good air circulation in the growing area is key, and can help plants dry quickly after watering or rains. The addition of a fan or fans to the growing area can improve the airflow and help prevent rots. At first signs of infection, segregate all affected plants to avoid contaminating healthy plants. Finally, some growers recommend the use of a high-calcium fertilizer in the spring to help avoid black rot in new growth. To stop the spread of black rot in your orchid, begin with a sterile knife and cut out the diseased portion of the plant. Remove all infected plant material, taking out a small amount of healthy tissue bordering the infected area as a safety precaution. Examine the cut portion carefully. It is sometimes possible, especially in pseudobulbs, to see a brownish discoloration extending into the interior of tissue that appears healthy on the surface. In sympodial (many-stemmed) plants such as a cattleya, it may be necessary to cut below the leaves and into the pseudobulb to stop the spread of the disease. If the plant is badly infected, cut into the rhizome, growth by growth, until you reach healthy tissue. For a monopodial orchid such as a vanda or phalaenopsis, remove the infected portion of the leaf, or the entire leaf if necessary, to halt the spread of the fungus before it reaches the crown. Place the plant in an area that receives good air circulation to allow the cut to dry. Once the infected plant parts have been removed, a fungicide should be applied to protect the remaining healthy tissue. Cinnamon is an excellent fungicide, and ground cinnamon may be applied straight from the spice jar directly to the exposed area where infected portions of the plant have been excised. First Rays Orchids also recommends mixing cinnamon with either casein-based glue (such as Elmer's) or cooking oil to form a thick paste. This paste is fairly waterproof and can be used to cover the wound. Another poultice that was developed specifically for use on orchids is StopRot. The product contains a Bordeaux mixture in lanolin. The Bordeaux, a mixture of copper sulfate and lime, has fungicidal properties. The lanolin seals the wound to keep moisture out. Whatever method is chosen, be sure to cover all of the exposed (cut) area with the fungicide or sealant, so that no new infection can be introduced to the open wound. Drenching the affected plant with fungicide is also an option. Drenches of a protectant fungicide such as Truban or Terrazole are recommended if the disease is diagnosed early. For more advanced cases, a systemic fungicide such as Aliette or Subdue is more effective. Captan, Dithane M-45 and Physan 20 have also been recommended by some growers for control of black rot. To protect seedlings against damping off, water with the fungicide of choice (at the dilution rate for seedlings specified in the product's instructions) as soon as they are deflasked and potted in compots. Afterward, treat with a preventive fungicide at two-week intervals. Simone, Gary W., PhD, and Harry C. Burnett, PhD. 1995. Diseases Caused by Bacteria and Fungi, in Orchid Pests and Diseases. American Orchid Society, West Palm Beach. CLAN Tropicals and Orchids R Us, Inc. 2001. Common Rots: What To Do When Your Plant Falls Victim. Camp Lot O'Noise Tropicals, Sarasota. Fortner, Linda. 2002. The Orchid Garden: Wilting Flowers. Suite101.com. Thoerle, Lisa, Ed. 1995. Deflasking: Editor's Column, Fred Paget's Section. National Capital Orchid Society Bulletin 49(3). Canadian Orchid Congress Web site.